A bomb attack against a police patrol in Al-Musawara neighbourhood, in Qatif, eastern region, left one officer dead on Thursday, making the second attack in the same area this week. Officer Abdullah Treiki Al-Turki died in the attack, which also injured six other police personnel after the bomb device hit their vehicle. Saudi security forces are facing insurgency in Al-Musawara where minority Shias oppose demolishment of buildings reportedly used by terrorists to traffic drugs and store weapons. Authorities claim the demolishment of the building will give rise to a new and modern town. 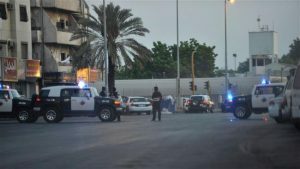 Attacks against security forces have become rampant recently in the neighborhood and in the entire Qatif province, home to Saudi Arabia’s minority Shia population, which complains about marginalization. Tuesday another early attack in the same area targeted security personnel, killing one agent on the spot, and injuring three others, one of whom died two days later. The region has been a flashpoint between the Shia militants called terrorists and security forces since 2011. Revolts calling for life improvement and rights are generally severely crushed. Tensions have heated again since the execution of Shia top cleric Sheikh Nimr al-Nimr early January last year on terrorism charges. Posted by KanelkaTagba on Jul 7 2017. Filed under Gulf News, Headlines. You can follow any responses to this entry through the RSS 2.0. Both comments and pings are currently closed.